Imagine having the best CRM ever, one that allows you to accurately assess and predict your performances. This creates an almost perfect scenario, because unless it is founded on a plan for user adoption, this perfect CRM will never achieve the expected results. Above all technologies, lies people. Even the best CRM requires a big quantity of accurate data for you to reap all of the benefits. A good part of this information must be entered by the CRM users. The omission of your sales team to systematically record opportunities in the CRM, will diminish the superpowers of your CRM. This almost perfect scenario is a reality faced by 20% of companies for whom the adoption of the CRM within their team represents a major challenge. So how do you convince your employees to use your CRM at all times? A good way of connecting your team to your CRM, is to choose dashboards that are efficient and simple to use. The more your dashboards are relevant and easy to use, the more likely your employees will use them to document their information into your CRM and use it consistently. With modern BI tools, you will be able to access a wide variety of charts and view the information according to your needs. By grouping and analyzing your results in various forms such as charts, graphs and simple histograms, your employees can access a complete overview of the company. Your team will see and understand the importance of entering information into the CRM. Efficient dashboards are a good way of providing your employees with an overview of the company, also inciting your employees to use your CRM. These dashboards, however, must allow your employees to accurately assess the performance of your company. Achieving this requires your CRM to have relevant data. A modern BI tool allows you to connect your CRM to several external data sources, such as Statistics Canada, HBR, or Euromonitor. You can import this information into a single system, your CRM. Your company can then better assess its performance by comparing it to that of your industry. Your employees then have real-time access to these results. 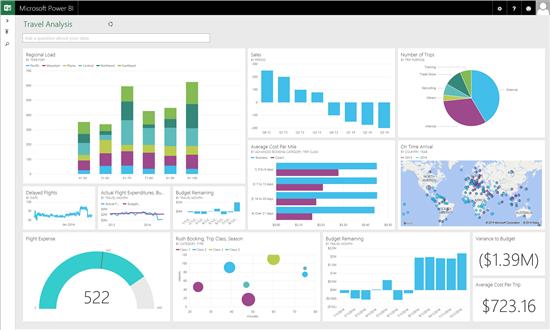 The Power BI application allows you to link your CRM to different data sources. It is normal for you to feel like you are explaining to a group of amnesiacs that they must use CRM. Bad habits will usually resurface once the initial threat has subsided. This is why encouraging is more useful than demanding. By rewarding the use of CRM, you increase the positive impact of this behaviour, which improves your chance of changing it! Post > Publicly announce which employees use CRM the best by posting their names on an honour chart. Prioritize > Create an interactive list in your CRM that rank the most experienced to the least consistent employees. Gamification > Gameplay encourages your employees by creating a friendly competition. We at XRM Vision used a combination of these methods to improve the completion rate of the electronic time sheets that must be filled out by our employees. This data is required for us to make important decisions regarding the months ahead. To encourage our employees to complete these sheets on time, we have integrated a game-based approach to this task using our business intelligence tools. Based on a real-time report available on the employee portal, everyone gets a “Shaka” hand signal (?) for every day they complete their time sheet on time. This list, which is visible to everyone, creates a friendly competition between the “players”, especially since at the end of each month, a draw rewards the most consistent players. While we initially had 35% completed time sheets per day, this rate has gone up to 80% in three months, since the beginning of the game. 4- Use the data report as a basis for the discussion between the employee and their supervisor. The sales pipeline is a very useful BI tool which allows you to know the accurate progress of opportunities. But when it is newly integrated into CRM, the opportunities must be entered as quickly as possible by the sales team. This new approach maybe resisted by sellers who got accustomed to trusting their intuition. How do you encourage them to use CRM? The key is to create a report as a basis of discussion between the employee and their supervisor. The sales person will then be able to efficiently discuss their activities with their supervisor. It is therefore in the interest of the salespeople to update the progress of their work. This allows the supervisor to better prioritize the tasks of the different salespeople and know if they will have any additional needs. This avoids overloading the seller with work. The 4 tips we have just mentioned, will help you to connect your team to your CRM. There are several other strategies and approaches that can be used to promote user adoption. For greater efficiency, these strategies must be planned at all stages of a CRM implementation project. You will learn more about this in our next series of articles, which will focus on techniques to increase CRM acceptance among employees. Modern BI tools can allow your employees to better understand the benefits they will gain from contributing to CRM. There are many other CRM challenges that can be solved using BI. As seen in previous articles, business intelligence can help optimize the customer experience, make decisions based on facts, or get a single version of the truth in your reports. If you would like to know more about how business intelligence can help you, watch our webinar on overcoming 5 major CRM obstacles using business intelligence, available online for free (in French). To know more, please contact one of our experts who will be able to provide you with personalized advice. Stay on top of the latest news by following us on LinkedIn and Twitter!